Steam Boiler(Fire Tube, HEF) - Taijune Enterprise Co., Ltd.
Tai June's strong technical group with long experience and outstanding reputation assures you energy saving with using the advanced HEF type steam boilers. HEF type three-pass wet-back fire tube boilers assure continuous operation at 1:5 of turndown ratio and still maintain boiler efficiency as high as 88~90%. It is also possible to increase the efficiency to 92% by adding heat recovery systems. HEF type boilers have sufficient heating surface and wet back design, keeping strong construction and durability. Advanced combustion system equalizes combustion gas temperature in furnace and improves efficiency greatly and simplifies operation and maintenance. High reliable control parts for water level safety guards with triple monitoring devices ensure safe operation with proper firing sequence. HEF type boiler s keep exhaust gas temperature and boiler surface temperature low to fully utilize the energy and minimize the heat loss. It takes only about 15~20 minutes from cold start to reaching 8 kg/cm2 of steam pressure. Due to integrated construction and combustion system, your plant operators of maintenance technicians can easily handle all maintenance. 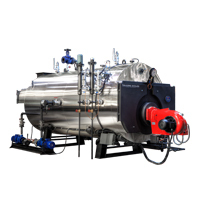 The HEF seires boilers are available in, steam boilers, pressurized hot water boilers and atmospheric hot water boilers.